At the hotel you’ll find several bouncy games at our new Playground: among these, we have a small trampoline, an elastic one, a playground, a ball pit and a castle with slide to enjoy a lot of time together having a great fun! Our marvellous outdoor pool awaits you with plenty of water games and ultra amusing splashes thanks to Splash Down, the new water slide you’ll find at our hotel: playing in the water has never been this funny! 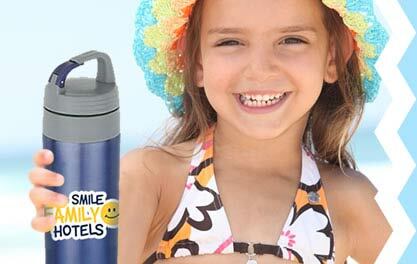 Designed for every family, Hotel Lotus provides Bottly, a fantastic customized, useful and functional water bottle you can always carry with you for water and fresh drinks, even at the beach! There are so many things you can take with you … and space is never enough, we know that! 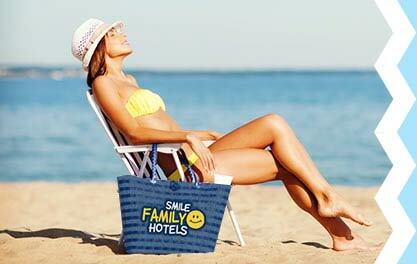 That’s why we thought about Bagghy, the spacious family-size beach bag you’ll receive upon your arrival at Lotus Hotel! The strong point of our hotel in Rimini is the entertainment and our fabulous pool which is one of the biggest in Marina Centro. The pool is 18x8 m² and surrounded by a gorgeous garden on grounds of 2000 m². 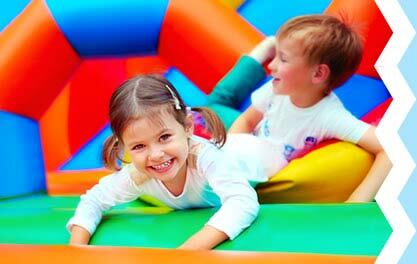 On the grounds there is a large garden area there is a solarium with umbrellas and beds and a spacious children’s area with a 6x8 metre inflatable castle, bungee trampoline and ball pit. *Cultural and gastronomic itineraries and excursions organized by external agencies. Theme evenings: Romagna-style dinner, Poolside Happy Hour, poolside Doughnut Party and Nutella Party. 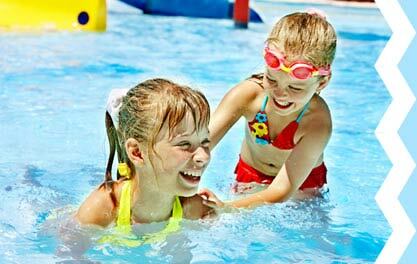 There are many fun activities for adults and children that are planned and arranged by our staff. 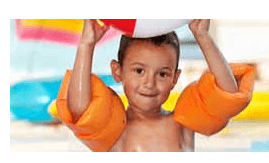 From swimming lessons to fun theme parties, from PlayStation comps to Latin American dance challenges, and tourist excursions, trips and much more. This is one lovely hotel with great staff. Despite being the only English in the hotel and speaking very little Italian, we where made to feel at home from the moment we arrived. The atmosphere was warm and welcoming.The hotel itself is typically a 3* but is what you expect. It is clean and tidy and we had no issues with the rooms. Indeed, along with our bed, there was one for our three year old and a cot for our 20 month old. The room was ample for what we needed.The real plus was the staff and other parts of the hotel. The staff could not do enough for you and our waiter (Manuel) was extremely helpful every mealtime. We did the full board and had no bad experiences. There was plenty to choose from and, for what you paid, the food was excellent value. We thought about just doing B&B and eating out but I would say that the food is good enough to stay and the atmosphere in the dining room was fab. Even those staff that could speak little or no English still made us feel at home.The location was a bonus. It was just positioned off the strip so was a little more quiet and secluded but within walking distance and anything you wanted (around 25-30 minutes to the harbour). The beach is just a 5 minute walk too and this is one of the great aprts of Rimini. The only issue was the train noise as the hotel backs onto a busy line. However, during the night it is not too much and you really did stop noticing it after the first night.During our stay it was the wife's birthday and Nicole (the extremely helpful and kind owner) offered to make a cake which was duly rolled out to the singing of happy birthday - a wonderful surprise for the wife and a really nice gesture.The pool is good and there is a play area for the kids. There is a Kids Club too which our two where a little young for but still they made some friends and enjoyed themeselves.I would recommend to anyone thinking of staying in Rimini to go to the Lotus. For the price you pay, it is excellent and with the facilities and location there is little to have a moan about. It is perfect for families, although we are already looking at a break next year for just us two and will be pricing the Lotus up.Well done to all the staff and I cannot recommend it enough.